Published Sunday, December 11, 2011, OK personal/derivative use; link www.lovethatimage.com. This photo is about the green, green leaves as least as much as the simple but pretty yellow-and-white blossoms. How DO they get that foliage to be so perfect? And it’s straight out of the camera (see SOOC Sunday), too. Check out Mellow Yellow Monday, Today’s Flowers, Weekend Flowers, Macro Friday, Macro Monday, Macro Flowers Saturday and Floral Friday for lots of fun in the photoblog world. Try something new here before you go, and click on Sara’s Fave Photos to get the entire blog at your fingertips. 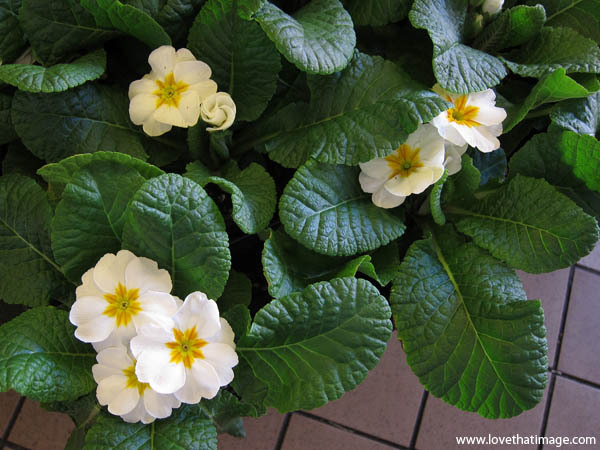 Wow so this is primroses it’s very pretty. Very pretty flowers.Thanks for your visit. The flowers in my header are the blooms of Gloriosa superba, a native of India. I love these gentle little primroses. Just delightful. I am calling by as a first time participant in Macro Monday, Primroses never disappoint. We have to wait to see them growing again ! Beautiful ! What lovely primroses Sara. They remind me of the primroses I saw growing on Dartmoor back near my home in England. Hello and I hope GOOGLE TRANSLATOR will cope with what I write. First of all, your picture is beautiful, and I really like primroses. Thank you very much for your very nice comment for me. I appreciate your comments. 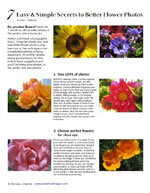 I play with images of nature, I started a blog on the assumption, that in February this year. So I am learning all the time and attention are weighing. Thank you that you wrote it in Polish, though I think without that I would give you advice with understanding. But I appreciate it :-). Yours sincerely (I will learn from you). Thank you for taking part in Floral Friday Fotos. I will endeavour to get the FFF site up on Thursday every week. Have been very busy with work and Mr Linky has been misbehaving as well.